Okay, I suppose that should be crazy bird family. We love birds at our house. We have several feeders and keep them loaded all year long. Even though we do have birds around all year long, the numbers fade over the winter. But this week, it seems like they’ve all come back. In droves. Mama and Papa cardinal are staking claim in our pine tree, red wing blackbirds bicker on the bird feeder, there are dozens of robins bopping around. The annoying grackles are back, trying to intimidate the goldfinches from the thistle feeder. Mockingbirds sing, sparrows hop. 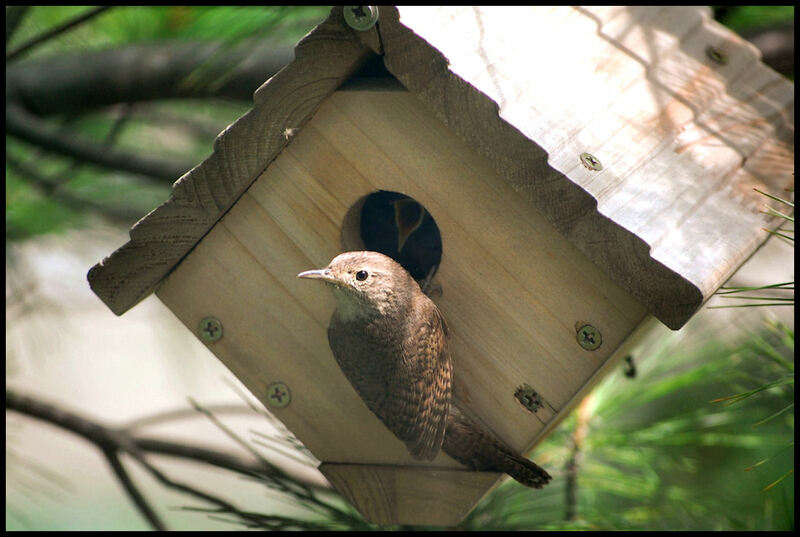 Wrens flit around prettily, and take up residence in our bird house. Blue jays swoop in for peanuts, jaying loudly to let all the other birds know who’s boss. Oh, and the mourning doves...so sweet, so simple-minded. Coo. Coo. There are chickadees, cowbirds, dark-eyed juncos, and soon, hummingbirds. Our newest regular visitor, however, is one I’d like to see stay away. 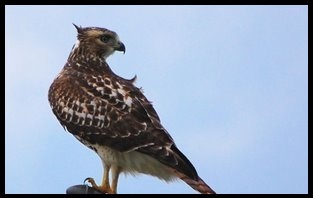 A beautiful red-tailed hawk. He circles above our yard, lands in the pine trees, and we’ve even caught him on the bird bath. He needs to go—he scares all the other birds. Probably because to him, they’re snacks. Other than when the hawk visits, the yard is full of activity, of sound. Of happiness. The bird chatter never ceases to make me smile. It’s one of the many reasons I love this time of year so much. Are you a crazy bird person, too? PS: All photos taken by Mr. W in our yard. Those are awesome photos, Heather. When we lived in Richmond, we had a huge variety of birds come to our yard too. We bought a bird feeder and hung it outside our kitchen window just so they could entertain us. Here in Bermuda we don't have a bird feeder, but still get birds on our patio--kiskadees, bluebirds, cardinals, finches. And now that spring is on the way, the birdsong is divine. I guess I am definitely a crazy bird person too! Yes, absolutely! I love birds. Unfortunately, the neighbours cats has taken to prowling the wall between our yards, scaring them away. So, when ever I see that cat, I pull out the plant spritzer thingy, and shoot him wet (if he is not fast and runs away). I prefer birds in my tiny little garden. 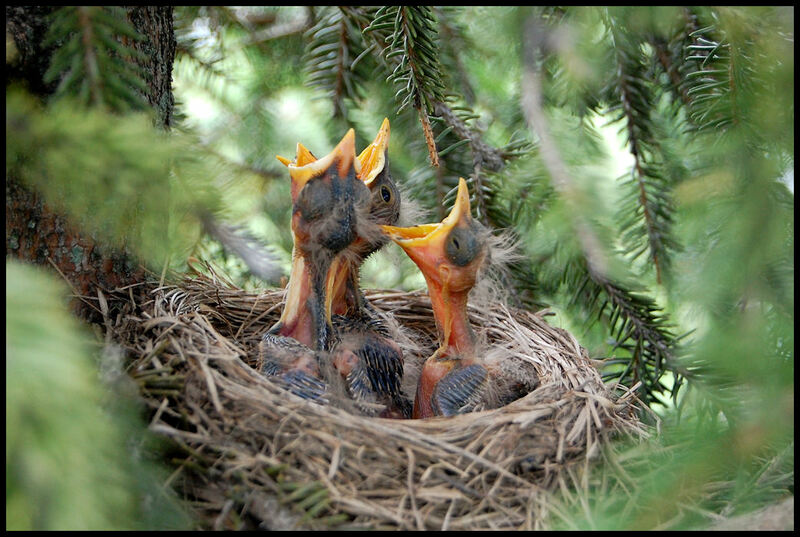 Robins built a next that they used for two seasons just outside my front window in a tall bush. I have feral cats roaming around looking for low lying nests, so I dismembered the nest. I think a cat got the fledglings the first season and it broke my heart. Your pictures are wonderful! Tell Mr. W he did an amazing job! I love listening to birds but last year we had a very unwelcome visitor. A woodpecker! We have wood siding and they seem to love it :( As soon as we save up enough we will put on vinyl siding but it will take a while for that. We had to patch 20 holes last year! I love all birds but that dang woodpecker! Mr. W. is a talented photographer! I posted a comment early today and just noticed it is missing! Hope that isn't happening to others. Anyway, what I said was, I LOVE birds, even have a life list and a board of birds at Pinterest. The birds are so entertaining--love the idea of a board on Pinterest, Deb. We had a feral cat stalking our feeders a couple of years ago. Just horrible! I agree with the other comments, your husbands photography is quite good! 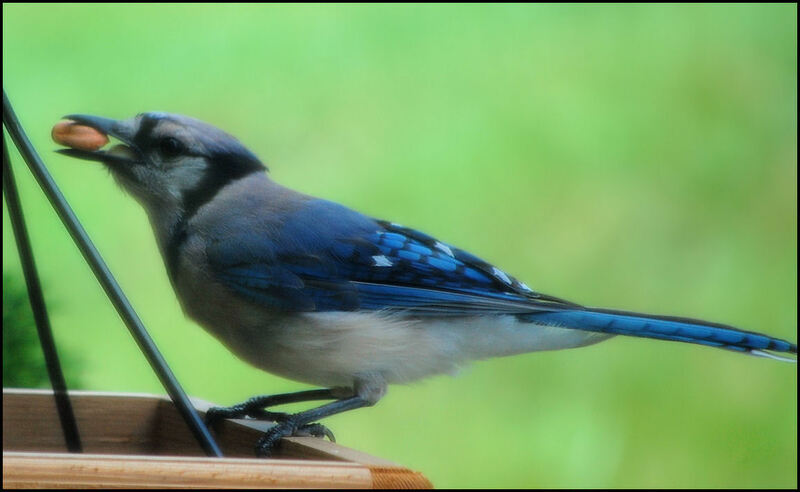 I used to have feeders up when I was in my house in NC and loved watching all the birds. Since moving to NY and becoming ill I haven't been ale to hang the feeders. I still enjoy looking out at what birds are on the patio, fence, etc. . . They are so lovely to look at. Thanks for sharing yours with us.